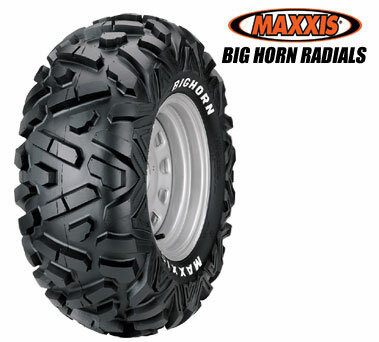 - Our Maxxis Bighorn ATV tires generally ship out within 1 business day! - Radial construction for great traction. 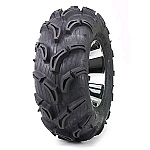 - Extra wrap around tread for rocky conditions. - Raised white letters on one side of tires. They are great tires for the style of riding we do which is a lot of rocks and ledges. I run them on a 800 s.
2nd set purchased from pureoffroad. Tires are terrific. Traction and ride could not be better. Service is always outstanding from pureoffroad. Thank you. I put these on STI Beadlocks - same size all the way around for common spare. (26x9R12) and am very pleased with the look. good clearance and added about an inch of ground clearance. thank you again PureOffroad! I was surprised that the big horns are about 3/4" larger in diamter than other tires that I have (GBC) but they look sweet on my machine. I've used these on a few rides and quite a bit in snow. They ride smooth, turn easy and have good traction in the snow and mud. I'm not 100% certain it was worth the extra cost for the radials yet, but time will tell. Put these on all 4 corners of an 800 Renegade. I can get up over stuff now I couldn't before. So much better than the stock tires. Raised withe letters look cool also. Not to mention super fast shipping from Pure Offroad. Got here in 2 days. My husband bought these tires off of pure offroad. They are awesome! This is the second time having their tires, and we have never had any problems with them! The service through Pure Off Road was awesome! Tire rides and performs very well. Great handling tire actually very predictable handling thru the hard pack trails and forest service roads. Awesome tire. Will cross over on many different terrains. Shipping and customer support are off the charts. Ordered these on STI HD3 rims. Had 27" bighorns prior just wanted some more height. After sale service was top notche... they ship quickly and arrived quickly and was great communication during process from seller. I run these tires on the rear of my 2010 Kawasaki Teryx 50 LE, I ride in West Virginia and they perform very well. Pure Offroad's Maxxis tires are priced right and I plan to buy my next set from them. A: No, they don't offer this tire in that size. The closest they make is a 27-9-12 which is just 1 inch skinnier . Or a 27-12-12 which is 2 inches wider. Q: is this tire with the rim included for that price? also do you carrie upper soft doors with zipped windows? A: No the rims are not included. They are sold separately. If you buy rims and tires we mount them together for you. A: Yes we do carry upper soft doors with zipped windows for certain models.